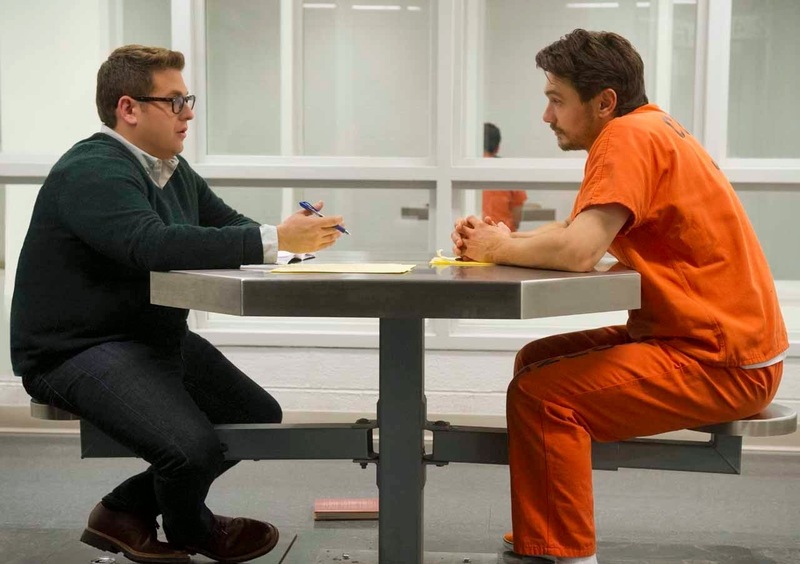 The immediate assumption when seeing a movie starring both Jonah Hill and James Franco is that it is of course a comedy, but when you place the fact both of these guys are Oscar-nominated actors in front of that you can understand where things might not be all you expect. In a new collaboration between the actors simply titled True Story there is little to smile about, much less laugh at. All of that taken into consideration, I wasn't sure what to expect given this seemed a deliberate attempt, especially from Hill, to further his dramatic career while Franco is so over the map at this point it was up for debate how much time and effort he actually put into the role of a seemingly normal man who came home from work one night and murdered his entire family. To these points, suspicion was dismissed fairly early as director Rupert Goold (making his feature film debut) jumps right into the hook of the piece while following it up with an intense exploration as to why that hook might have existed in the first place. The readily available chemistry between Franco and Hill is on full display as the majority of the film concerns itself with these two central characters figuring out the other with the remaining facets outside these more fascinating moments being more by the numbers. We've all seen movies based on real life crime stories of course and have become accustomed to the beats they hit as far as how to figure out the big question of whodunit and why the typical protagonist might make certain mistakes, getting too close to the case for their own good, but this only happens in True Story part of the time and while it certainly detracts from the more fascinating relationship formed between Hill's Michael Finkel and Franco's Christian Longo there is enough here between the two of them to create a rather enticing piece of character study for the audience to decipher and ultimately decide where we come down not just on the accused murderer, but both of these men. Michael Finkel (Jonah Hill) encounters Christian Longo (James Franco) for the first time. Michael Finkel was a reporter for the New York Times who'd accrued nine covers of the publications magazine before the age of thirty-three. When he was discovered to have created composite characters for a story he had written on the African slave trade he was promptly fired. With his career on the line he moved back to Montana with wife or girlfriend or whatever she is in Jill (Felecity Jones) who the movie doesn't care to clarify a relationship with in an attempt to put his life back together. Shortly after returning home, he receives a phone call from a reporter at The Oregonian (Ethan Suplee) regarding an FBI Most Wanted individual named Christian Longo. It seems Longo, who'd recently been captured, had been claiming to be Michael Finkel with the New York Times. Having not heard anything about this situation prior Finkel sees this as nothing short of an opportunity knocking on his door. There is undoubtedly a story here and seeing as Longo was pretending to be him there is also a curiosity present in Finkel to know why he was the chosen one of sorts. Inevitably, the two men meet while Longo is in prison awaiting trial. In these initial meetings Finkel makes it clear he is present to find out not only why Longo decided to impersonate him, but if he did what he was accused of doing. It is also made clear that Longo wants the assistance of Finkel in hopes that he may help him win acquittal. There is clearly more to Longo's plan than this though as he is quick to set-up his admiration for Finkel, the writer, and lathers on the compliments almost to the point we immediately suspect the man of purely taking advantage of this man who he's implanted a sense of connection with simply by flattering him. As the conversations run deeper, Finkel becomes more wrapped up in the stark charisma of Longo and delves into writing a portrait of this man no one but him seems to understand. How the film approaches the dynamic between the two is golden, but as the film builds to a third act courtroom drama it can't seem to keep up with the deceptive Longo. 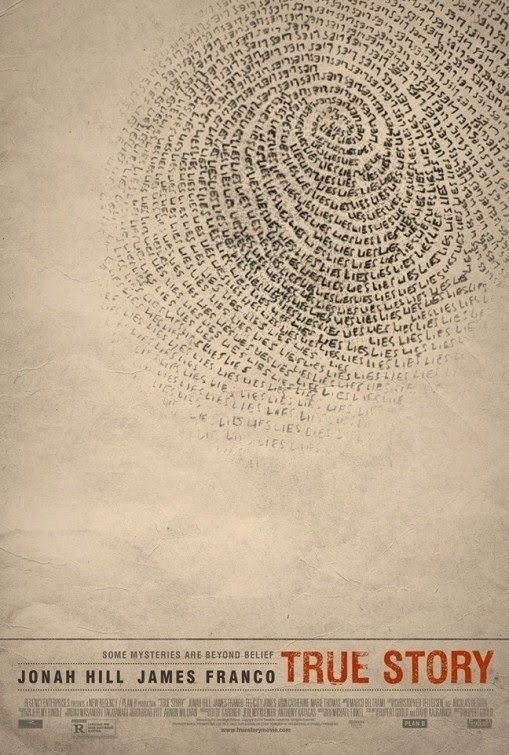 The title of the film comes as much from the events of the film being based on a true story as it does the plight of Finkel attempting to uncover the true story of Christian Longo. If it's not clear already, the meat of this story is the interaction between our two leads and more the angle each of them are playing at. We know that Finkel is keen on digging himself out of the hole he's placed himself in by turning this strange set of circumstances into a best-seller, but those of Longo are more uncertain. It is easy to forget that Franco is actually a solid actor as so much of him and his major films at this point come off as something of self-parody. I, while enjoying his comedic sensibilities in films like Pineapple Express, Spring Breakers and This is the End, have come to kind of dismiss him as being capable of anything greater than what he's already accomplished. While Hill, on the other hand, has been delivering on both fronts in credible pieces for several years now. What Hill has done differently though has been to find a way to balance his comedic skills with those necessary to being a part of the drama. He utilized his appearance and facade in Moneyball and his improvisational skills and taste for the outlandish in Wolf of Wall Street with the main difference being those films hold a more pedigreed set of credentials than anything he did in the purely comedic genre. In continuing to stretch his range Hill finally steps into strictly dramatic territory with True Story and while he has the less-interesting role, essentially playing the straight man to Franco's serial killer, there was something about the characters persona that didn't immediately strike me as likable. While main characters don't have to necessarily be people we like, it doesn't hurt and that my slight disdain for the character had nothing to do with his bad decisions early in the film struck me as odd. I'm a guy who clearly likes to write and while writers typically don't like most people they can at least relate to other writers, but there was something distinctly loathsome about the guy. What that says about the performances, I'm not exactly sure, but what it says that Franco's character seemed more in tune with the tone of their conversation is telling. Michael Finkel and his wife Jill (Felecity Jones) disagree on the extent of his relationship with Longo. That this comes from the book written by Finkel only makes my uneasy feelings about the character all the more striking. I understand that the real-life guy could be totally different from the demeanor Hill presents him as having onscreen, but for the purposes of reviewing the film the more interesting aspect of it all is how well and for how long Franco's interpretation of Longo is able to fool the audience into thinking one way or another about him. He is an enigma of a character that floats in and out of a cell, only fully reflecting on his existence in the countless hours he sits alone. Much of this time seems to be taken up by writing down his life story, a decision that not only builds a closer affinity with Finkel, but one that seems to genuinely further Longo's desire to be a better writer. In putting this life story to paper Franco's character is more easily fleshed out with possible motivations and outcomes being hinted at. These, together with the stone-faced portrayal presented by the actor lend an enticing aura to the man we want to believe is innocent, but can't come to buy into all the way. In every moment that Longo confesses something about his personal life Franco intentionally does little to add any emotion to his words. His performance is all the more striking for it and in the single scene he shares with Jones both are electrifying while perfectly encapsulating the reality of the situation and the inhumanity of it all. This is not to discount the performance Hill gives as it is more than competent and for his first, true dramatic turn it is more than solid in a way that conveys the necessary tragedy, confusion, desperation and depressing aspects of the story in a way that resonates. It just so happens the more interesting part goes to his counterpart and that overshadows his performance more than the fact I didn't necessarily like or trust his character either. Despite the fact this is based on a true story (no pun intended) and that the bulk of Goold and David Kajganich's screenplay comes from the real Finkel's book there is always room for interpretation and change to make a story more dramatic, especially when presenting it in such a format as the movies. There is clearly more to the film than just these central performances, but they are the highlight. The cinematography is striking in its choice to stay surrounded in pure white environments whether it be the cells of Longo's prison or the landscapes of Montana. Goold is sure to keep his camera trained on the single elements that stick out of these landscapes all of which adds to a consistent pacing that leads with the critical aspects of the picture and takes their critical story detail from scene to scene driving the suspense. There is some striking imagery from the opening shot down to that of little more than Franco's hands that are as manipulative as his eyes. True Story isn't what you would necessarily call an enjoyable experience, but it is startling where it needs to be with a compelling relationship at the center and a creepy tone that Goold elicits overall only made all the moreso by Franco's surprisingly committed performance.